Specialty Gutter Installation in Sacramento – Call For Your Estimate Today! Specialty Gutter Installation in Sacramento California reviews the different types of specialty gutter available. All of which we install across Sacramento. From half round to copper gutter & even deco gutter. All of which have their own appeal & benefits. Specialty Gutter Installs require far more skill than standard seamless gutter & require more time. Gutter Installation Services offer 7" + 5" seamless gutter which seems to be the standard in Sacramento or stick gutter. While the most beautiful homes have specialty gutter installed around their home. Which brings life and character to the exterior of the home. Half Round Gutter - This style of the gutter is a circle cut in half with the bottom used to carry water. This style of gutter carries about half the water as the standard seamless based on size. This style has it's own unique variations of hangers because of the design which changes the price based on the difficulty of installation. 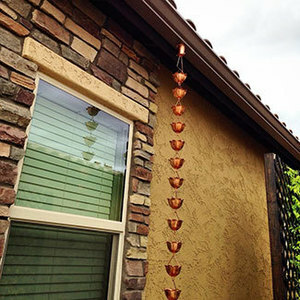 Copper Gutter - Copper Gutter installation is fairly custom due to the cost of copper. 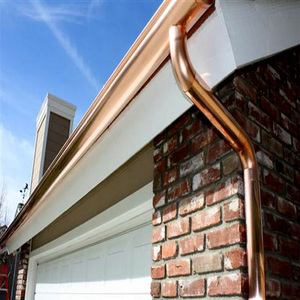 When installing copper gutter every mistake is costly and temperamental to install. The slightest miss step or error could cause the purchase of another piece. As homeowners, we are all faced with decisions that will add your own personal touch to your property. Having a new custom specialty gutter installation in Sacramento will provide your home with the beauty you didn't know it was missing all these years. You will discover that by making the choice to have custom specialty gutters installed you will have increased your home value and saved a ton of money on the maintenance/repairs/replacements that come with any other type of gutter system out there. Call Monster's Gutters for a comprehensive estimate on a custom specialty gutter installation in Sacramento today! A Custom Specialty gutter installation adds curb appeal. Custom Specialty gutters are not commonly chosen, so your home could be the only one on the block with a Custom Specialty gutter system. It adds elegance and value to your home. As well as increasing your property value. With a Custom Specialty gutter installation, you will have two choices depending on what style you decide to go with. One is called a patina and takes several years to accomplish. If Custom Specialty gutters are left untreated you will get this rustic beautiful look after several years. If you prefer the natural new Custom Specialty look, they will need to be treated with a sealant to prevent the oxidation process. A Custom Specialty gutter installation will last a lot longer. Custom Specialty has been a material used in roofing since through the ages and has withstood the test of time. Custom Specialty does not rust and is a strong and durable metal. A Custom Specialty gutter installation in Sacramento will last for the entire life of your home. We promise that it will be the last gutter system you will ever need. Most other gutter systems are made of materials that will rust away in just a matter of years. Custom Specialty is resistant to corrosion in and variety of weather and environment. Unlike gutters made of other materials, Custom Specialty gutters can withstand extreme temperature variations. With a Custom Specialty gutter installation in Sacramento there will be little to no maintenance. Custom Specialty is also a fungicide and algaecide, this prevents things like moss from growing in your system and causing blockages. This will assure minimal cleaning. At Monsters Gutter Sacramento, we pride ourselves on our quality of work and our installers are highly trained spending thousands of hours perfecting and mastering their craft to make sure that we install, and complete a high-quality product for you. With that being said we at Monsters Gutter Sacramento puts a 2-year workmanship on all of our work to bring you the peace and mind to know that you are working with the best in the industry. 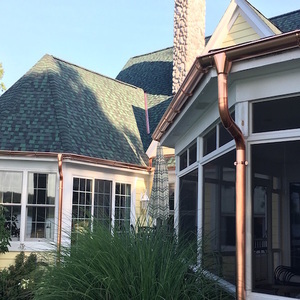 If you are interested in learning more about the costs of Custom Specialty gutter and installation of custom-made copper gutters or zinc gutters for your home give us a call today. Monsters Gutter Sacramento is committed to bringing you a complete product that will last you for decades to come. Monsters Gutter Sacramento offers competitive pricing throughout the Sacramento, CA region. If you have any questions or are interested in a consultation give us a call today and will be happy to help.